In the world of sports, a mismatch describes the relationship between a superior player and an inferior player. Think: Lebron James vs most other mere mortals. In our context, a mismatch describes the relationship between a business task and an employee or department that is ill-equipped to accomplish that task. These mismatches can appear throughout an organization but the accounting and finance functions are often the last to be upgraded in light of growth or strategic change. 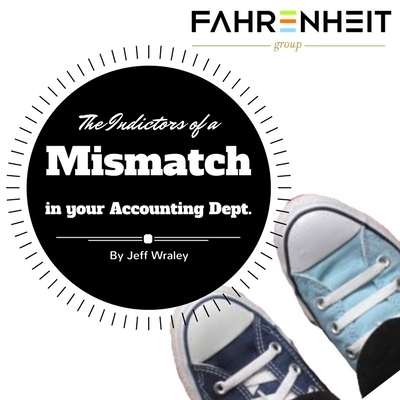 Click here for more about mismatches in the accounting and finance groups. So, what are the indicators that can tip managers off to these hidden mismatches? The list below describes situations that produce these not-so-ideal, but fixable situations. Different types of businesses require different types of accounting and finance support. Accounting in a SaaS business is a lot different than in an inventory-based business. An adjustment to your market focus or client base may indicate a need to review your processes and resources. I am consistently amazed at how many small businesses have the same accounting lead that they had when they started their business 15+ years ago. Despite growing the sales staff and operations team and maybe even moving to a new location to accommodate the growing organization, the accounting team is still a one-man band or close to it. I smell a mismatch. If your company has implemented a new accounting system, it might be time to look for some additional financial oversight. Systems are seldom implemented flawlessly and existing resources may not see opportunities to take advantage of the new system’s functionality. I smell a mismatch and an opportunity. Is nothing changing? Has your business plateaued? This mismatch may be between your current support structure and the version that would spur on growth. What decisions would be clearer if your accounting and finance team provided you with more valuable insights? In addition to some self-reflection, an assessment of your accounting processes can reveal mismatches that may be hiding in your organization.